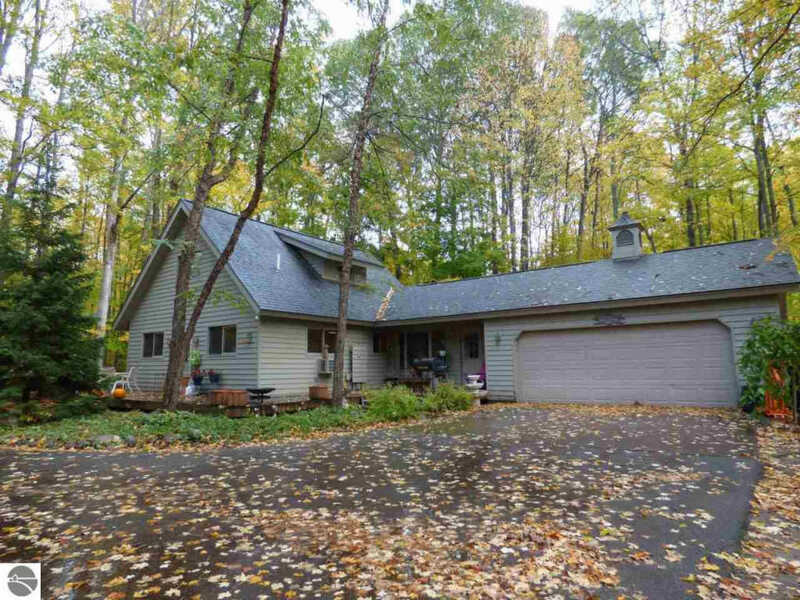 This spacious 4 bedroom 2 bath home is just minutes from the slopes at Schuss Mountain Resort and is nestled among the towering hardwood trees on a double lot. The main floor offers hardwood floors, an open floor plan, bath, laundry and two bedrooms, one of which could be used alternatively as a family room. Two additional bedrooms and a shared bath occupy the upstairs. You will enjoy views of the trees from every room. A spacious deck wraps around the front of the house offering plenty of space for entertaining and cooking out. The 2 car garage is attached, a particularly nice feature during inclement weather. A winding blacktop drive offers plenty of vehicle space for guests. There are a few cosmetic details to be addressed, but the home has excellent potential. Are you ready to enjoy 4-season recreation at Schuss Mountain / Shanty Creek Resort? This home can be your home base for all the fun Northern Michigan has to offer.